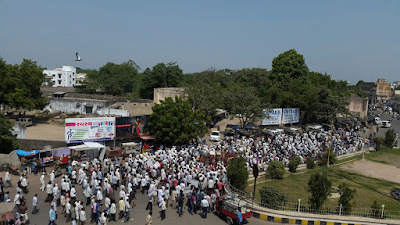 In a show of strength, nearly 5,000 farmers of 42 villages around Junagadh, a major city in Saurashtra region of Gujarat, have protested in front of the district collector’s office, Junagadh, demanding that their villages should excluded from the new Junagadh Urban Development Authority (JUDA), as planned. After taking out a rally in the city, they submitted a memorandum giving reasons for not their villages to be outside JUDA. District collector Alok Kumar Pandey took the memorandum from a group of representatives of the protesting farmers, who he met him, but refused to either cool down the farmers’ tempers on how JUDA, in government view, would “benefit” the farmers, or whether there is going to be any possibility of amending the JUDA decision. “The district collector merely took the order and said he would forward it to the authorities in Gandhinagar”, said farmers’ leader Sagar Rabari from the Khedut Samaj – Gujarat. The district collector is chairman of JUDA, too. This is the second protest meeting in Junagadh within a week against the Gujarat government move to include the 42 villages in JUDA. The first meeting took place on October 6, when about 2,000 farmers gathered to understand what JUDA meant to them. They were told about how they stand to lose in case their villages become part of JUDA. The farmers were told that, by allowing their villages to be included JUDA, they stand to lose 40 per cent of their agricultural land, as all the 42 villages would directly fall under the Town Planning Act. The Act requires farmers to hand over 40 per cent of the land in the name of developing city infrastructure, and hands over rest of the 60 per cent land at a different spot. 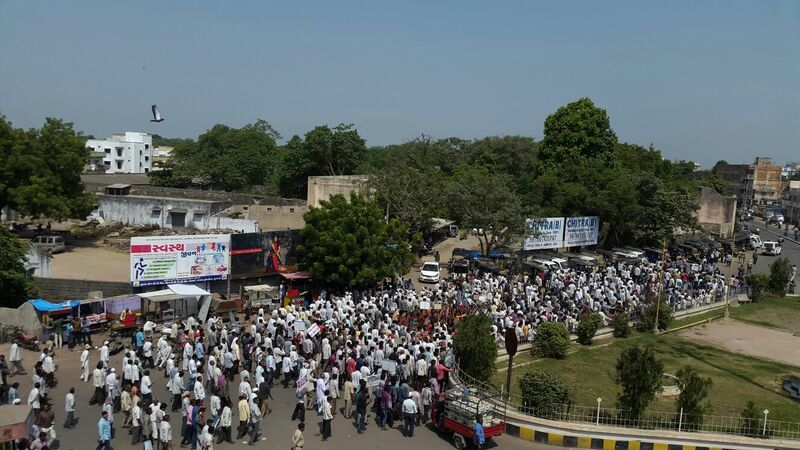 Taken out under the banner “Resist and Reject Urbanisation”, a ground report on the rally from Junagadh said, the people of 42 villages belonged to Junagadh and Vanthali blocks of Junagadh district, and were agitated against their inclusion into JUDA. 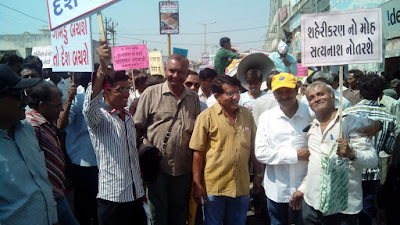 The Khedut Hit Rakshak Samiti was led by Atul Shekhda, while Sagar Rabari represented Khedut Samaj – Gujarat and Jamin Adhikar Andolan Gujarat (JAAG). Similar protests have broken out among villagers of Surat district, who have refused their inclusion into the Surat Urban Development Authority (SUDA), and Sabarkantha district, whose villages do not inclusion into the North Gujarat town of Himatnagar.